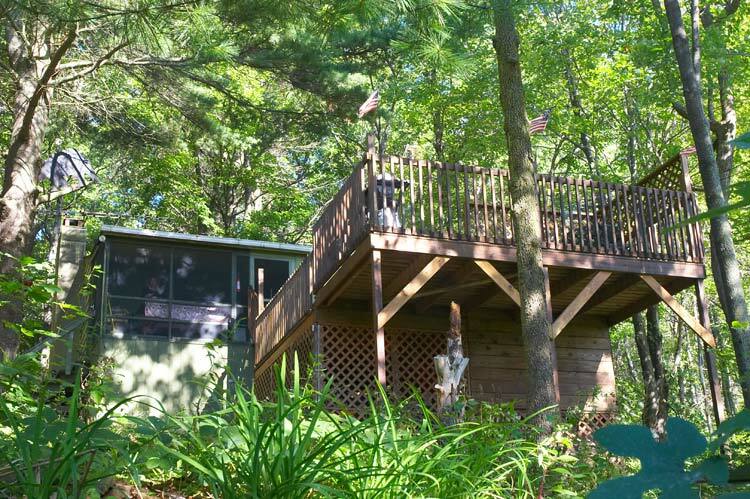 This cozy vacation rental cabin, which is located in the Pocono Mountains, in PA, will offer you a high quality vacation at a low price, which is just 1-2 hours away from NY, NJ, and Philadelphia. You will enjoy a hot tub, fireplace, gas grill, High Speed Internet, and all the comforts of home and more! It is nestled on the side of a mountain and in the woods. It is near the Blue Mountain in PA, and located in the Pocono Mountains, PA.
After parking by the hand-made stone wall with stones picked from the property itself to build, walk up a steps made out of logs to a very cozy one bedroom cabin with a real fire place and a 5 person out side Jacuzzi, open all year 24/7! Entering the cabin to the left is a cozy living space with a queen-size sofa bed, a full size futon bed, TV with digital cable, which plays DVD and VCR movies and a fire place with all the wood provided. Bathroom w/shower and all towels provided. Full kitchen w/pots, pans, dishes, ECTï¿½ One private bedroom with a full size bed. The 3 beds combined sleep up to 6 people. Bedroom has sliding doors that can be opened for those nice warm days and nights. The cabin is located in the town of Kunkletown with all the comforts of home and more. Hot tub! Fireplace, High Speed Internet! It has a queen size sofa bed, one full size futon bed, and one full -size bed in a private bedroom. All together these beds sleep approximately 6 people. The cabin has all new appliances, which include a refrigerator/freezer, electric- stovetop range/oven, microwave oven, toaster oven, and a coffee pot. Also, it has a telephone to make unlimited- local calls and a TV that is equipped to play DVD and VCR movies. The TV has Digital Cable, which offers over 100 of the most popular channels. Donï¿½t worry about packing any bedding, bath towels, dishes, pots, or pans because everything is there for your convenience, including silverware. Inside the cabin there is a living room with a fireplace that is complete with furniture, full bathroom, full kitchen and dinning area, and one private bedroom. The cabin is located on a mountain and on wooded land. It has a screened in porch, multi-level deck, five-person-outside- hot tub, shed, and a heated basement for the skiers to store their wet items. There is parking for approximately three vehicles and a stone wall that surrounds it. Tour and shop in the Poconos. Ski at Blue Mountain Ski resort. Concerts of all kinds of music and entertainment are performed at Pennï¿½s Peak. 15 Min away from Jim Thorpe. Musikfest is located in Bethlehem, PA, which is approximately a 45 min drive from the cabin. If you like to shop, there is the famous Pocono shopping center, just a few miles away. If you are a hunter there are Many State Game lands near the cabin, and/or if you enjoy to fish, you can fish right at a private Lake or at many major stocked streams nearby. For the folks who like to enjoy the fun in the sun there is Beltzville Lake. For the ones who love to watch racing there is the Pocono and Nazareth Raceways. Near by, is Hickory Run, which is a famous- state park and the Hometown West End fair is just minuets away. Dorney Park is a famous amusement Park, which consists of an outstanding water park with amazing water slides and rides. These are just a few of the popular attractions to enjoy during your stay at the cabin. We would suggest picking up brochures at any near-by convenience stores, restaurants, or gas stations for more detailed attractions. There are many activities that can be enjoyed during your stay at the cabin without ever getting into a car. The cabin is located on a hill in a wooded area which is great to go walking, hiking, or dirt bike riding on. Also, with just a short walk, you could enjoy the private Lake. At the lake, you could enjoy fishing (with a license), swimming, rafting, or picnicking. Also, there is a pavilion to enjoy an outside barbecue and a play set for the children is located on the other side of the lake. For the lazy days, you can just rest and relax at the cabin by sitting around the picnic table located in the screened in front porch, or enjoying the outside, while out on the multi-level deck, taking in a beautiful- mountain- view. While out on the deck, you might want to lavish yourself by soaking in the five-person hot tub, which is built down into the deck with plenty of privacy. Or perhaps, you would rather just stay in-doors watching TV that plays DVD and VCR movies or Digital cable, while sitting by a warm fireplace. I am sure that any of these activities, and many more, will be truly enjoyed during your stay. So donï¿½t delay! Take this great cabin- vacation- get -away near the Blue Mountain in PA. We look forward to hearing from you! I accepted most major credit cards. Check in time is 3:00 PM and Check out Time is 11:00 AM. The more you increase your stay, the more the rate will decrease per day!!!!! 3 days/2 nights	$440.+$26.40	$466.40	4 days/3 nights	$590.+$35.40	$625.40	5 days/4 nights	$690.+$41.40	$731.40	6 days/5 nights	$790.+$47.40	$837.40	7 days/6 nights	$840.+$50.40	$890.40	8 days/7 nights	$890.+$53.40	$943.40	Check-in time is 3:00 PM and Check-out time is 11:00 AM. Rates include two adults and their children with a maximum occupancy of 4-6 people. No extra charge for children!